As the Vols entered the NCAA Tournament last year, there was no blueprint. SEC Champions at 25-8 (13-5) and a No. 3 seed, Tennessee was capable of winning games in a variety of ways. Turns out we didn’t have the drawings for Kyle Alexander’s absence and divine intervention on a Loyola-Chicago bounce. You just never know in March. But that team had as good of a chance to advance in the NCAA Tournament as any in Tennessee’s history. And, as we’ve known for months now, this year’s team is more than just better than last year. March works both ways. The only Tennessee team to make the Elite Eight in 2010 lost five times in the regular season by double digits, then by 29 to Kentucky in the SEC Tournament. They survived No. 11 seed San Diego State in round one, and took advantage of an upset in thrashing No. 14 Ohio in round two. And then they played one of the finest games in school history in beating No. 2 Ohio State, and were seconds away from the Final Four against No. 5 Michigan State. Sometimes you get that path to the promised land: 11, 14, two, and five. Or the one that was in front of the Vols last season: 14, 11, then what would have been seven and nine in Atlanta. Sometimes you get chalk. The next-closest Tennessee team to the promised land was 2007, who survived a knock-down, drag-out No. 4 vs No. 5 game with Virginia in the second round, then had a 20-point lead on No. 1 Ohio State before giving it away at the free throw line. And sometimes you get 2014: millimeters away from firing the coach, then winning in overtime in the First Four, then beat downs of No. 6 UMass and another thrashing of another Cinderella in No. 14 Mercer in round two. And then falling to No. 2 Michigan in the Sweet 16 on a hotly disputed charge call. When we throw around, “The best in school history,” how do we define it? In recent years, was it 2008? Ranked number one after another of the finest games in school history at Memphis, outright SEC Champions, but vanquished by 19 points in a bad match-up in the Sweet 16? Is it Pearl’s first team, easily one of the most memorable seasons in school history, who fought their way to a No. 2 seed only to fall in round two? Seasons are always heavily influenced by where they end in March, but as all of them end with a loss save the champion, you have to be sure to celebrate appropriately along the way. Last year’s Vols got the nets and the SEC rings at 13-5. This year’s Vols went 15-3 and will come away empty handed on that particular piece of jewelry. But everything, ultimately, is about giving yourself the best chance to win in the bracket. Not all jewelry is created equal. Build your team to produce its best basketball at the right time, and win enough games to make that path as easy as possible. Cuonzo Martin’s last team, play-for-play, rated the best of this era before this season began. It lost a ton of close games (0-6 in games decided by six points or less) and rated 341st in luck in KenPom. But it was also capable of evisceration, as it did to Virginia by 35 and plenty of other teams down the stretch. This team, after all, had more NBA players on it than any in Tennessee’s recent history. Meanwhile the 2008 Vols – 13-3 in games decided by six points or less – finished fourth in luck in KenPom. The 2010 Vols weren’t far behind at 20th, going 6-1 in games decided by six points or less before falling to Michigan State. Which season is best or most memorable? Much of that is up to you to decide. You never know in March. Here’s what we do know: no matter what happens in the SEC Tournament, this Tennessee team will be better positioned to make a run to the Final Four than any I’ve ever seen. Tennessee’s current KenPom rating is 27.93. That would make them a 4-6 point favorite over 2008, 2014, and last season; they’d be almost a 10-point favorite over the 2010 Elite Eight squad. And they’re 145th in luck, going 4-3 in games decided by six points or less. As always, the best way to win close games is not to play them. And Tennessee is playing them against the right teams: five of those seven close game opponents are going to the NCAA Tournament, six if Alabama can get in. We have seen incredible individual efforts from these guys. Grant Williams with 43 at Vanderbilt. Admiral Schofield with 30 against Gonzaga. Jordan Bone with 27 against Kentucky. But Tennessee’s best basketball still does not follow any individual blueprint. This goes the other way too: Lamonte Turner certainly struggled from the arc in Tennessee’s losses, but he also went a combined 0-for-7 in Tennessee’s two best performances of the season against Kentucky and Mississippi State, and had a signature performance in one of Tennessee’s best wins at Ole Miss. We’re well-versed in what gets Tennessee beat: opponents getting to the free throw line far more often than the Vols. What qualifies as Tennessee’s best basketball is, in part, the opposite of this: great defense without putting the other team on the line. What the Vols did against Kentucky and Mississippi State is what will get them through in March. But the Vols are also more than great individuals on the other end of the floor. The Vols are 24-1 when they have at least 15 assists, 3-3 when they don’t. 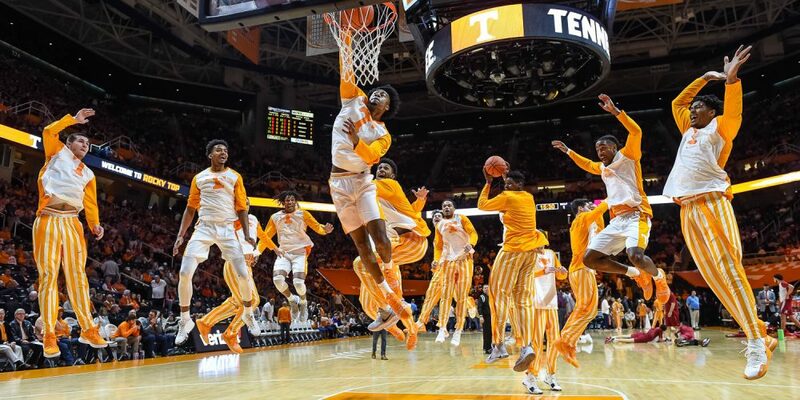 For all the strengths of their individuals, Tennessee’s best basketball still comes when the team flows together: a commitment to great defense without fouling, and an offense that flows through good ball movement creating great shots. One fly, we all fly indeed.